It's January and it's cold. You'd be forgiven for thinking that our huge stocks of outside garden and patio furniture are safely stacked up in our distribution centres, waiting for the warmer Spring and Summer months to arrive. However, you'd be wrong, and this is where creative event professionals come into their own, always innovating and offering something different to the norm for their clients. 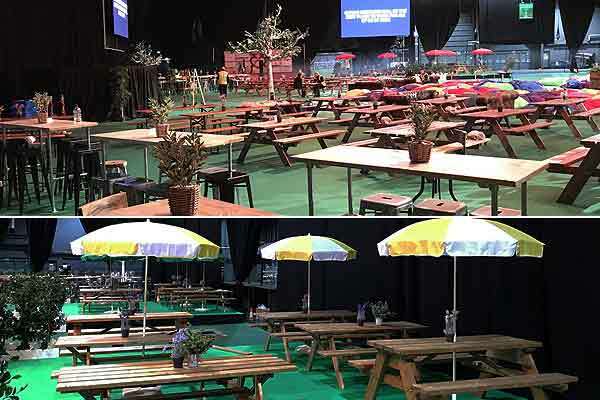 One great way to do this is to use this outdoor furniture for indoor events in large arena settings such as this is at the SEC Glasgow recently. Check out the picnic benches, even complete with colourful parasols! Even when the summer seems a long way off, it might just feel that little bit closer now! Whatever your event styling, experiential ideas or themed party, the chances are that the furniture hire UK experts here at Event Hire UK will be able to assist, from chair hire, table hire, outdoor furniture hire and much more to help you create unforgettable events and occasions. And remember, when you hire from Event Hire UK, you are working the best!